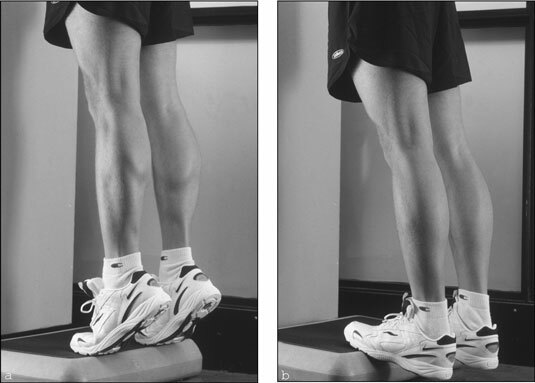 The standing calf raise works your calf muscles. Lift as high as you can onto your toes and lower your heels down as much as your ankle flexibility allows. Push evenly through the entire width of your foot. Don’t push off from your big toe or the outside edge of your feet. Lie on the leg-press machine with your shoulders snugly underneath the pad. To lift the weight stack, straighten your legs completely, and carefully walk your feet down the foot platform until your heels hang off the end. Keeping your legs straight, rise up on your tiptoes as high as you can and then lower down until your heels are below the level of the foot plate. After you complete all the reps, carefully walk your feet back to the center of the foot plate before bending your knees and lowering the weights. As an alternative to the standing calf raise, try the toe press on the leg-press machine.